LAST GO AROUND. The volleyball and cross country parents are recognized for their support. When watching a volleyball match, or a football game, most people just see on the players. 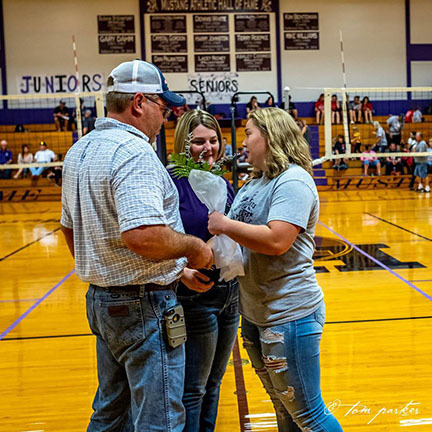 What people don’t see is the tireless support the athletes receive from their parents. This past Tuesday, at the home volleyball game versus Frankfort and Hanover, Student Council sponsored a “Parent’s Night.” Every participant in volleyball and cross country was listed in the program with their parents’ names. In between games, the senior parents were asked to come greet their son or daughter at midcourt and accept a small gift. “I really cherished that moment, being able to thank my parents for all they’ve done for me. I especially loved the framed notes that the volleyball seniors wrote to their parents, it made it extra special,” says senior, Andrea Hudson.